Its my first real food post of the new year and like many people around the world, one of my new year's resolutions is to eat healthier. In general, I think I eat pretty well but I have a big weakness - sweets of all kinds - and this year, I'm trying to be more moderate about it. This year, I have added incentive to be good, at least until May, because our big day is coming up! Yup, our wedding is about 4 months away. Yikes! Towards this end, one of goals is to cook a little more and bake a little less. As such, you may find the recipes that I post here veering more towards food than desserts. To start off the new year on a healthy note, I found a recipe from Bill Granger that is reminiscent to me of spa cuisine. You know the kind. Typically found on menus of cafes in spas, they are usually dishes that are fairly simple where the main ingredient is allowed to shine through without being smothered by heavy sauces and the like. 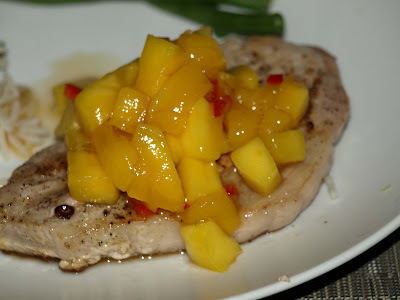 Today's recipe features pork as the main ingredient which is seasoned only with sea salt and black pepper but whose flavour is enhanced by a mango salsa topping. Despite the simplicity of ingredients, I thought it tasted great. The added bonus was that dinner was on the table in 25 minutes tops. I served mine with a side of french beans and mangetout and a small portion of wild rice, but I'm sure it'll be equally good with a green salad or mashed potatoes. Brush the pork with oil and season liberally with salt and pepper. Heat a large frying pan over a high heat for 2 minutes until very hot. Sear the pork for 1 minute on each side, then reduce the heat to medium and cook for 4 to 5 minutes longer on each side, or until cooked through and golden. Remove the pork from the pan and leave it to rest for 2 minutes. For the mango salsa, stir all the salsa ingredients together in a bowl to combine. 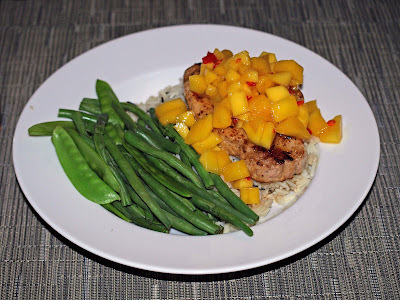 Serve the pork with mango salsa, rice and greens. I love salsa for the same reasons you name - meals are quick, tasty, healthy, and moist. Mango salsa definitely ranks highly on the salsa scale - good discovery! Pork with mango! I wonder if I would have become a vegetarian if my mum had cooked this on Sundays.